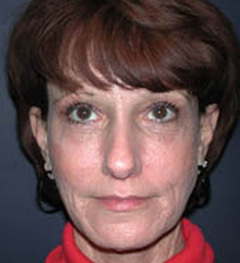 This 51 year old female came to Genesis Cosmetic Surgery because she was not happy with the appearance of her face. When she was younger, she had acne, and this had left prominent acne scars. In addition, she used to be much heavier and had lost weight. She had a mini face lift two years when living elsewhere. Yet, this isolated procedure had not addressed some of her other facial concerns - namely the wrinkles around the mouth; the long, thin upper lip; and the sagging cheek tissues. As an outpatient, she underwent facial liposculpture, where fat is liposuction from the abdomen and injected into the various areas of the face, including the cheeks, tear troughs, upper and lower lips, corners of the mouth, temples, chin, and cheek folds. A total of 56 mm of fat was placed. Additionally, she underwent a lip lift, where a small amount of skin is removed underneath the base of the nose, resulting in a shorter, more full upper lip. Lastly, a TCA peel was applied to the full face to help with skin texture and fine lines. 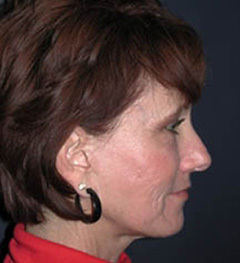 Her photographs are shown 2 months after the above procedures. She is very happy with the results. 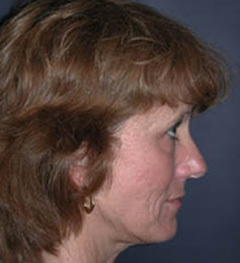 Notice how the facial liposculpture has resulted in a face lift type of improvement.